David Benjamin, who was staying at his girlfriend’s flat on the 4th floor, told the BBC he was asleep when he heard banging. He got up to investigate and heard a neighbour shouting “fire! fire!”. Another man who fled from the 17th floor said he was alerted to the danger by the arrival of fire engines. 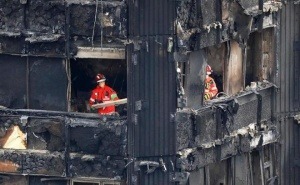 “We saw the fire engines, so we were looking outside at what’s going on. There was no fire alarms anywhere, because we don’t have a kind of integrated fire system – it’s just everyone’s house for itself. “I walked out into the common area to see if the lifts are moving, to see if people are in a hassle – nothing. But I could smell the smoke.” The man said he only saw fire when he stuck his head out of the window. He said he managed to get himself and his 68-year-old aunt through thick smoke and out of the building, but said he feared for the fate of others who waited longer to make their escape. A woman at the community centre was searching for her friend’s five-year-old daughter, who had become separated in the aftermath. Ahmed Chellat had come to the Rugby Portobello with his wife to look for his brother-in-law, his wife and three children. “We don’t know what’s happened,” he said. Many of the survivors criticised the lack of information they were receiving.